I’m sending a Happy Thanksgiving to all of you from me and my new adventure The Glass Studio. It’s my store and I have to say it’s one of the things I’m most grateful for this year. I’m living the beginning of a great glass dream and just wanted to share it with all of you. If you’re in Los Angeles come visit sometime. 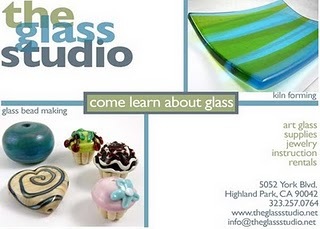 You’ll find kiln forming/fusing, glass bead making, mosaics and jewelry making. Classes and goodies! Thanks for letting me share with you! Happy New Year to All the Glassy Peeps Out There! !